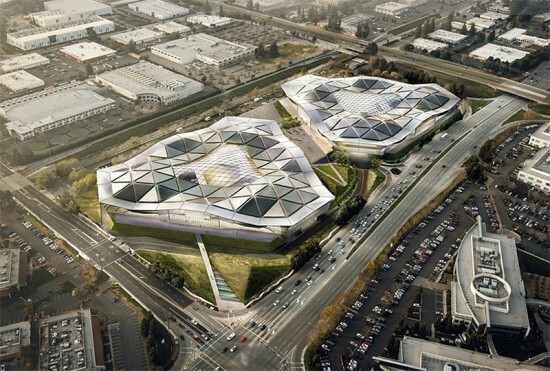 NVIDIA’s cavernous, Gensler-designed 500,000-square-foot headquarters opened for business late 2017, capping off a seven-year effort to create a new state-of-the-art office complex for the technology company. Located in Santa Clara, California, the triangular complex takes a decidedly inward approach to the open, creative office type. Unlike Facebook’s park-topped headquarters or Apple’s ring-in-the-forest complex, which feature expansive connections to the outdoors and commingle quasi-public access with offices, NVIDIA’s new home base is self-contained and mono-functional, more high-tech tent than big-nature oasis. 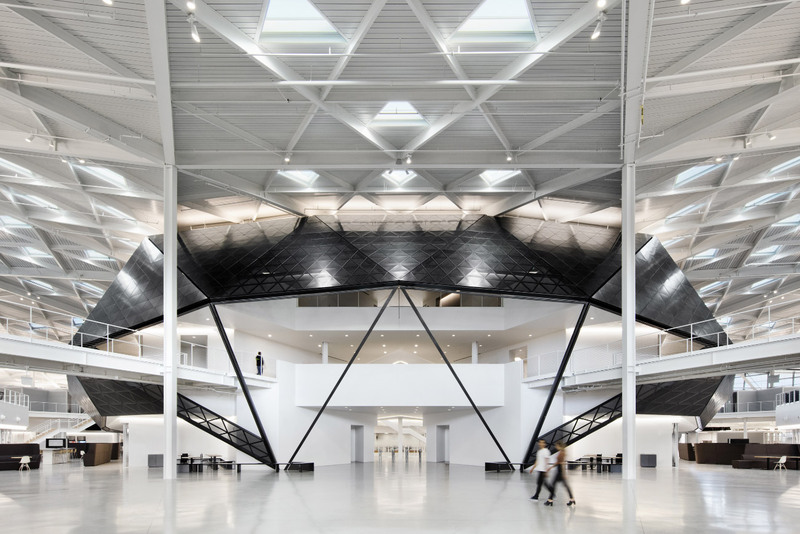 Instead of bringing the outside in, Gensler’s designs utilize a soaring internal volume and 245 perfectly calibrated triangular skylights set into a modular, undulating roof that turns the inside out. Workers are expected to arrive by car, entering the building’s underbelly via two basement parking levels containing 1,500 stalls. A glass-enclosed elevator core welcomes arrivals before whisking them to the cavernous offices above, where they are greeted by a faceted, black metal panel cocoon wrapping the all-white elevator core. This angular, two-story volume creates a sheltered area at the heart of the building underneath an orderly grid of skylights that was laid out using virtual reality software to determine each skylight’s final placement. 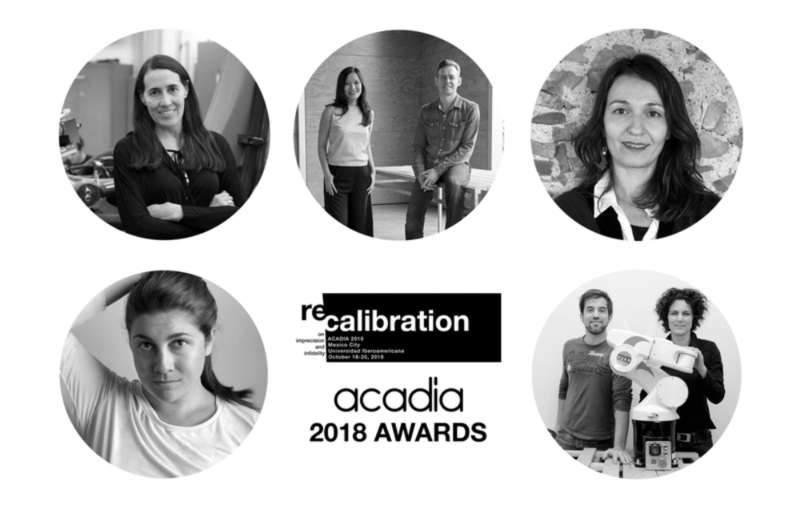 Hao Ko, principal and managing director at Gensler, said, “We worked hard to get the right specifications of glass makeup to allow us the right quality of diffused and soft sunlight in the space. 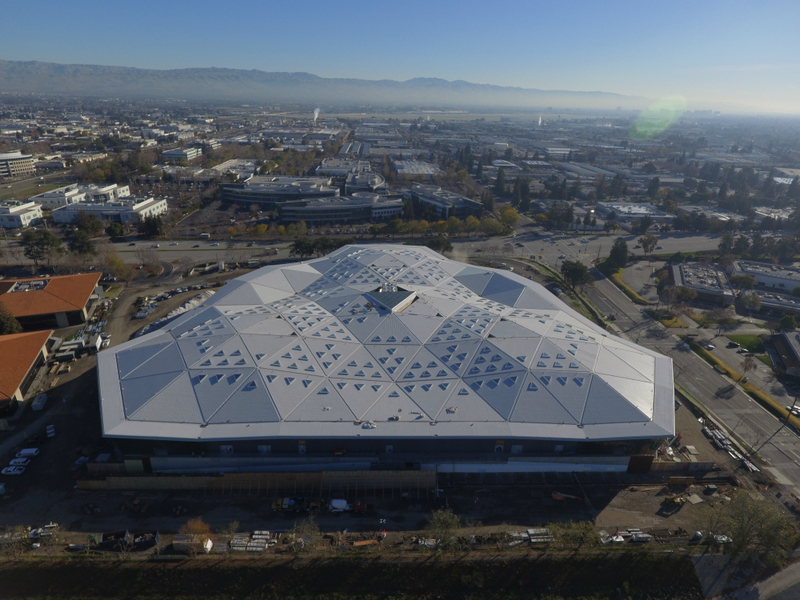 The final result—where the daylighting is evenly dispersed throughout and evenly experienced by everyone—is a testament to the upfront work we did in design.” Because of Santa Clara’s zoning laws, the structure could only rise two stories and ultimately topped out at 50 feet tall. In response, Ko’s team created two soaring levels within the arched envelope of the building, taking the opportunity to transform the office’s many staircases into broad, socially vibrant areas while also creating an upper level that functions more like a mezzanine than a fully-enclosed floor. Along the ground, squat cubicles, an institutional-seeming dining hall, and multifunctional lab spaces orbit the opaque core, which itself contains lounges, meeting rooms, coding nooks, and research areas. The level above, meanwhile, is populated by parallel rows of cubicles interrupted by acoustically-sealed meeting pods that extend every which way. The end result is a workplace envisioned and constructed to look good—and work well—in any light.